All reports are archived throughout the season for easy retrieval using your account login at any time! How do I access my snow and ice totals? Once your account is active, you can log in to our easy-to-use web interface where you can filter and search through your locations and their associated storm data. All the information on the web site can easily be printed or exported to a PDF or Excel file. In addition to our online platform, WeatherWorks offers a fast and easy-to-use API to access your snowfall totals. Click here to see the full API documentation. For more information and to find out the added benefit of using a Certified Snowfall Totals API, contact us today! How quickly after a winter event can I access my Certified Snowfall Totals™ report? CST™ reports are created on a state basis or in some cases, a regional basis and are generally published within the 48 hours after the conclusion of each winter storm event. Therefore, the report may not by completed until up to 48 hours after the event has ended in the entire state or region. Additional time may be required for long-duration or back-to-back storms. You will be notified at the e-mail address on your account when a storm report has been generated for your location(s). How can I be sure that a report will be generated for my location(s)? Any naturally precipitating and accumulating snow, sleet, or freezing rain will lead to the generation of a Certified Snowfall Totals™ report. Although we do not issue CSTs™ in the above cases, we may be able to prepare a custom report for an additional charge. The average cost for a custom report ranges from $75-150. Do Certified Snowfall Totals™ reports include refreeze events? We do not issue a CST™ report if ice formed from the freeze-up of standing rainwater or snowmelt. Snow and/or ice on the ground must come from accumulating precipitation in order for us to generate a CST™ report for it. First, a professional meteorologist determines where and when wintry precipitation fell by analyzing recorded observations from surface observing stations, Doppler radar imagery, and a network of over 1,000 web cams (among other tools). Next, our meteorologist gathers snowfall totals from a variety of sources including National Weather Service cooperative observers and storm spotters, observing networks run by colleges and universities, road and highway department personnel, private weather observers, media, on-line forums, as well as our own staff meteorologists and interns. Once all the data is collected, our meteorologist follows a detailed process to manually analyze the snowfall totals for spatial and temporal consistency, ensuring any errant or biased observations are removed from the dataset. Finally, our meteorologist assigns a representative snowfall total to each ZIP code, using the snowfall data they quality controlled along with their knowledge of the region (e.g., local topography). Bill or validate invoices confidently with the peace-of-mind that a trained snowfall analyst prepared your post-storm reports. Join the growing community of highly satisfied WeatherWorks Certified Snowfall Totals™ users today! Do you distinguish between snow and sleet? We identify the type(s) of precipitation experienced at a location in the "Type" column. If only snow fell, the type would be "Snow". If only sleet fell, the type would be "Sleet". If both snow and sleet fell, the type would be "Wintry Mix". Although we distinguish between snow and sleet in the "Type" column, the amount that shows up in the "Total" column is a combined snow/sleet measurement. It is standard practice to record a "solid precipitation measurement" which is made up of both snow and sleet. 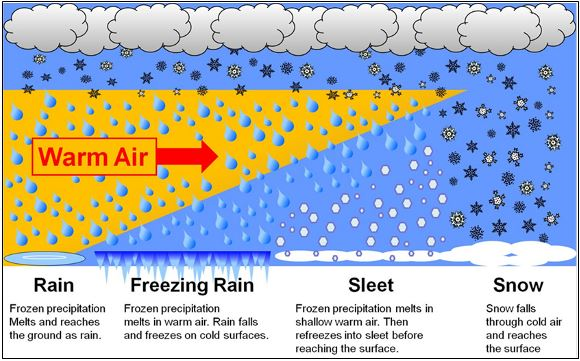 What is the difference between freezing rain and sleet? Freezing rain is precipitation that is observed to be “plain rain” when falling, but freezes on contact with the surface, forming a layer of ice. The ice accumulates on any surface exposed to the rain, including pavements, trees, powerlines, and cars. Freezing rain is often confused with sleet, but they are two separate types of precipitation. Sleet is formed when the cold layer near the surface is thick enough to refreeze the rain droplets into ice pellets. When sleet is falling, it makes the trade-marked “ping” sound as it bounces off the surface. What is ice accumulation? How is it measured? 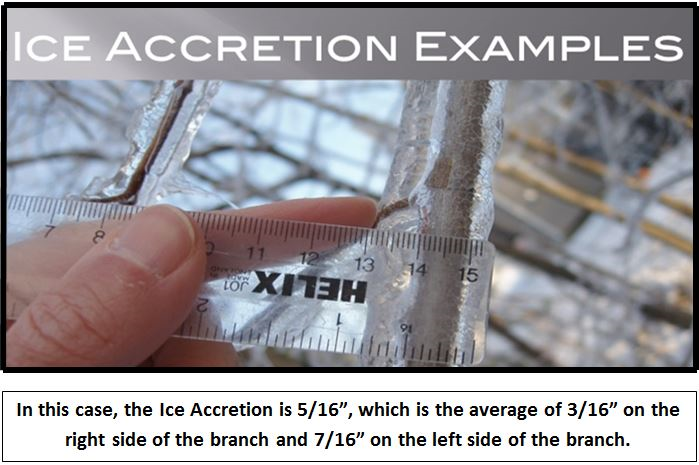 Ice accumulation is defined as the total ice accretion from freezing rain only. The ice is measured on exposed, elevated surfaces such as a tree branch or clothesline. The ice total is calculated by averaging the thickness on both sides of a surface. This is because ice does not accumulate on all surfaces evenly. Wind and gravity causes higher ice build-up on certain sides of an object. How are the snowfall measurements you collect taken? Snowfall measurements should be taken on a snowboard (i.e., a small piece of plywood painted white) placed on the ground in an open area not subject to drifting. If no snowboard is available, a wooden deck is an acceptable alternative. Measurements are taken using a standard ruler and can be performed as frequently as every 6 hours (clearing the snowboard after each measurement). The storm-total snowfall is the sum of all measurements taken during the storm, rounded to the nearest 0.1 inch. If snow has blown on to or off of the snowboard, several measurements should be taken from around the area where snow has not drifted, then averaged together. If the falling snow continually melts on the snow board and never reaches a depth of 0.1 inch, a trace of snowfall should be reported. It is important to obtain measurements as soon as possible following a storm’s conclusion due to the fact that newly snowfall can quickly become subject to compaction, settling, sublimation, or melting. The storm that just occurred was not continuous. Will you issue one or two reports? We will generally issue two Certified Snowfall Totals™ reports if there was at least a 6-hour break in naturally falling wintry precipitation for the majority of the state or region. However, our meteorologists reserve the right to issue one or two reports based on the evolution of the storm. If your contract requires a more detailed breakdown of the storm, we can prepare a custom report for an additional charge. The average cost for a custom report ranges from $75-150. An integral part of conveying snow and ice information is identifying the precise area where the information is valid. This is why for our CST™ product we created a custom location database, utilizing geographical data from the Census Bureau, USGS, and USPS. City boundaries and populated place centers are overlaid on top of ZIP code boundaries to determine valid ZIP code-City combinations. Why are some of your ZIP codes and cities different from the USPS? USPS ZIP codes were designed to make mail delivery more efficient and do not always follow geopolitical boundaries; they can cross cities, counties, and in some cases, state lines. The USPS will rarely differentiate between parts of ZIP codes that cross city limits, instead relying on one preferred city name for the entire ZIP code (leaving you with less choices than actually exist). These preferred names are usually derived from nearby cities, not necessarily using city boundaries to determine the most appropriate name for the ZIP code (possibly resulting in a preferred city name with which the ZIP code has no overlap). Our location database takes into account the potential overlap between city and ZIP code boundaries, giving you the most accurate and representative location choices possible. We designate a location as premium if it experiences a relatively high number (approximately 50 or more) of winter storm events per season. The substantial number of winter events can be due to frequent lake-effect snowfall as well as high latitude or elevation, among other factors. Premium locations carry a $90 surcharge on top of the standard rate resulting in a total cost of $139 each. Can I make changes to my locations after I sign up? Absolutely! Additional locations can always be added to your account. Keep in mind that if you add a location that was previously inactive, there will be limited or no storm history and you may not be able to retrieve any data for that site until the next winter event occurs. You can remove locations from your account at no charge during the year. You can exchange locations of the same type (standard or premium) at no charge through November 30th. Afterwards, you can add locations to your account at our standard and premium rates ($49 and $139, respectively). Note that you are only allowed one "swap" per location on your account.